In times of increased demands on publications, it can be difficult for editors to find credible reviewers. 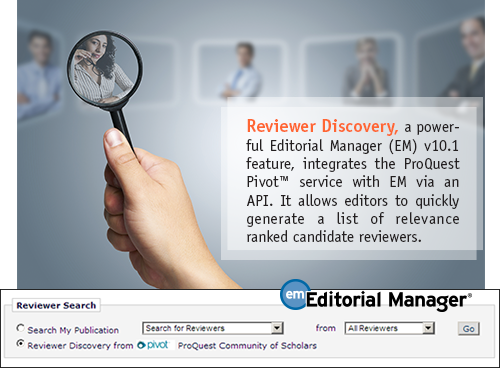 Integration between Aries Systems and ProQuest allows manuscripts submitted into Editorial Manager to be automatically matched with candidate peer reviewers from the ProQuest Pivot™ database. The Pivot database is populated via combination of automatic harvesting and human curation to deliver profiles from scholars at leading global academic institutions. Profiles include biographic and bibliographic information – including links to past publications. Pivot is continuously checking profile data to ensure that it is complete and current. Aries provides a free trial of this service to give editors the ability to assess this feature. Contact your Account Coordinator for more information.